This post will guide you through adding a new show and and has a link to a post about editing existing shows. If your show is to be sold with reserved seating, you must first have a seating plan before entering the show and creating the performances. Read about seating plans. Designing seating plans takes some time and a fair amount of working knowledge. 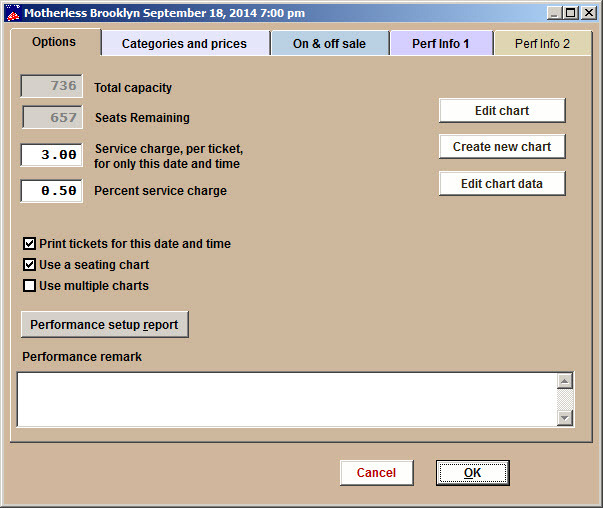 Center Stage Software inputs your first seating plan and can add more seating plans for a nominal fee. We highly recommend you let us do your seating plan work. In the Title field, type the name of the show you are adding. For the best ticket printing and sale screen appearance, restrict this entry to 26 – 30 characters. In the Abbreviation field, type a shortened name for the show. This entry will identify the show on reports. The field is restricted to 15 characters and will auto-format the characters entered as uppercase. Copy data from (this is a short cut so you don’t have to re-enter the show prices and ticket formats for every performance dates), copy run of show prices, and copy ticket format allows you to skip the trouble of entering this information for each performance. Wintix will automatically upload this data if these are checked. Click on the Add this show button. The Show information window appears. Now you are ready to enter the show information and add all its individual performances. Displayed sort order – normally, Wintix will display shows alphabetically. You can rank shows if you wish them to display in a different order. Event type – choose an event type for reporting and marketing purposes. You can create reports to see who purchased tickets for a certain kind of event and let them know about upcoming similar events. GL codes: In the General Ledger Code field, type a key word to describe the department. Later, you can run reports by the general ledger entry. The purpose of this report is to group the shows and their money into a list for each department. Venue – for more than one venue. Keep track of remaining seats keeps a running tally of the number of seats available for sale for each performance. This is handy when you are viewing a list of performances and want to know which dates have the best availability. If you ever need to update this figure, just run the seats remaining report. Special ticket format – most often you will use a default ticket format but this gives you added versatility. You can choose to print mailing labels while selling tickets. Show notes – a place to put ideas or information. Edit history – shows you who, when and what was edited in the show. Run of show prices – Use the run of show prices to put in the price codes for the entire run of show, instead of entering them in to each individual performance. Tip: Note the drop down menu and navigation buttons in the lower right-hand corner. These tools allow you to access other existing shows and performances. You can select a show from the drop-down list or use the buttons to view the first, previous, next and last records in your list of shows. Enter the date as six digits: mmddyy. You do not need to type the slash marks. Enter the time in any text format you like (8:00 PM; 8 PM, 8:00 pm, etc.). You may also choose to set when the event goes off sale and to copy performance remarks. As suggested, it is a very good idea to enter all your prices and ticket price text at this time. Wintix will copy all the price and ticket text information to any performances added later.This saves a great deal of work and eliminates data entry errors. The Performance setup window will be described in the posting reached by the link below. Click here to learn how to edit a show. Once you are done with the Performance setup window, You will back at the show page. Don’t enter anything else at this point. This will make your show, performance and price setup unduly complicated. Click on the Add price button when done. Click on the Internet options tab. 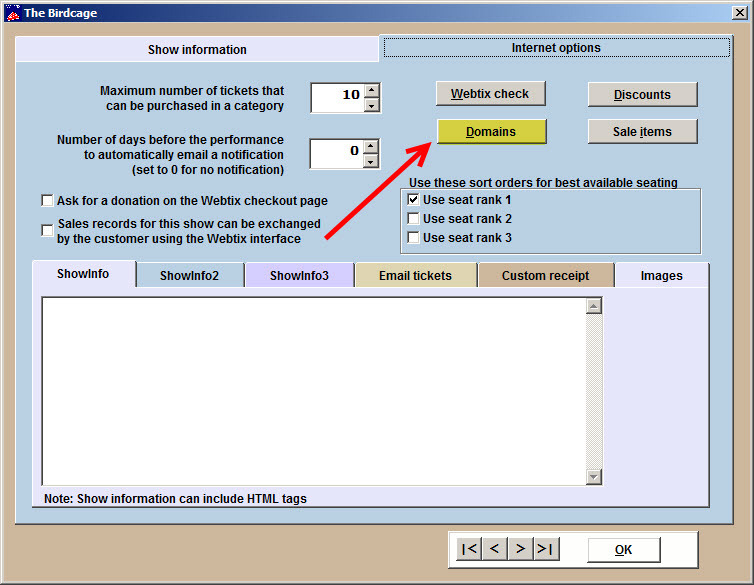 Click on the Domains button to allow Webtix to sell this show. 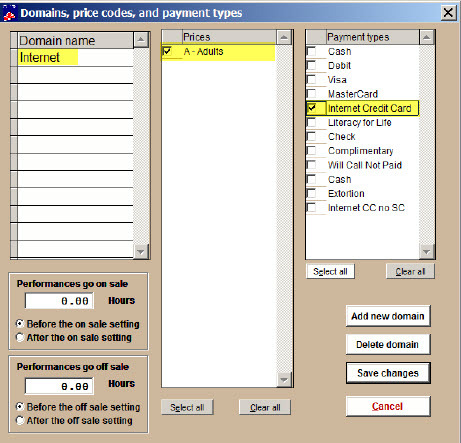 In Domains, price codes and payment types, you need to enter the domain Internet for Webtix sales, and check the price codes you wish to sell online (in the example below, we have checked the price A- Adults) and the payment type you are allowing Webtix to have. Check to make sure the show appears in Webtix. This entry was posted in Desktop Software, Wintix 6 and tagged tutorial, User manual. Bookmark the permalink.